(Inlay folding system for heavy doors 88 lbs. 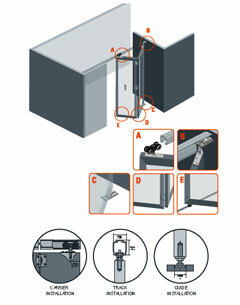 Inlay folding system for heavy doors 88 lbs. Wider doors, up to 750mm (29”1/2). Ideal for partitions or big closets applications. Ball bearing high quality rollers for a silent and smooth glide. U21 Aluminum track for a silent glide.